Solution: Suppose you flip a coin. What is the chance Heads will appear? What is the chance that tails will appear? Toss a dice. What is the probability that an even number will appear? The six numbers on a dice are 1, 2, 3, 4, 5, 6. On the dice, 2, 4 and 6 are the even numbers. In a bag, there are 3 green and 4 red marbles. Take out any two marbles out of the bag. What is the probability the two marbles are green-colored? Solution: Bag contains 7 marbles. 2 marbles are taken out. 2 out of 7 can be taken out in 7c2 ways i.e. 21 ways. 2 green out of 3 green marbles can be taken out in 3c2 ways i.e. 3 ways. The table below summarizes the salient points in the 3 examples above. 2. At least 3 heads. 3. At most 2 heads. 4. 3 heads, exactly next to each other. First find the total number of outcomes when 5 coins are tossed. It is 2 × 2 × 2 × 2 × 2 × 2 = 25 = 32 outcomes and not 2 × 5 = 10 outcomes. So, 3 coins give 2 × 2 × 2 = 23 = 8 outcomes. 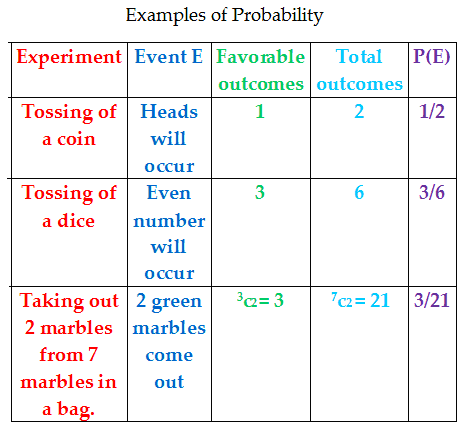 Likewise, 5 coins give 2 × 2 × 2 × 2 × 2 = 25 = 32 outcomes. Now, how many outcomes show 3 heads out of 32? You must use an easier way to find favorable outcomes, with a formula probably. We need 3 Heads. Which 3 coins must show the required 3 Heads? Any 3 coins. So, select any 3 coins out of the 5 coins. In how many ways? Yes, in ncr ways, i.e. 5c3 ways i.e. 10 ways. Each way is one outcome, 10 ways are 10 outcomes. At least 3 heads means minimum 3 heads i.e. 3 or more heads i.e. 3 or 4 or 5 heads. At most means maximum 2 heads i.e. up to 2 heads, i.e. less than or equal to 2 heads. 2 Heads or 1 Heads or No Heads. 4. 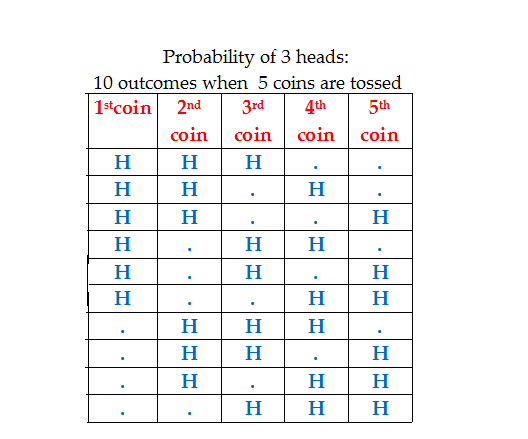 Probability of exactly 3 Heads, next to each other. H H H . .
. H H H .
We must tabulate the outcomes that give 3 Heads as it is a special case. 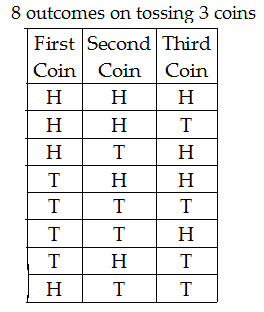 (Note: In the first row, 5th coin cannot show a Heads, for we need only 3 Heads and the series 5th, 1st and 2nd coin is not acceptable for Heads to fall next to each other).